Ponca City, Okla., April 11, 2019 – Whispers of a canceled first day due to 35 mph winds spread this week as anglers pre-fished the legendary Kentucky Lake in Paris, Ky., in Henry County. As luck or fate would have it, anglers were met with mild waters for take-off as they launched from Paris Landing State Park Marina. Kentucky Lake was stingy today and while the wind did pick up it wasn’t anything TBF’s 106 State Champion anglers couldn’t handle. 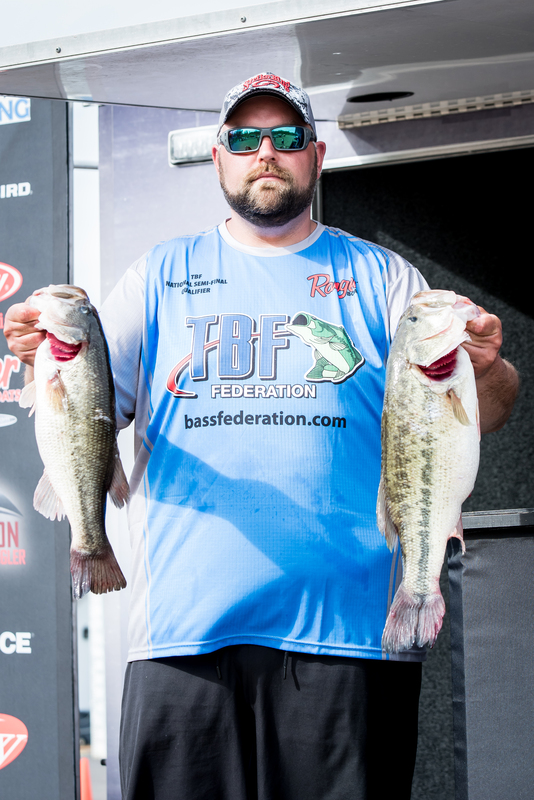 Jason Bacon is on top of the leader board overall and in the Eastern Division from the Massachusetts TBF with 21 pounds 6 ounces. 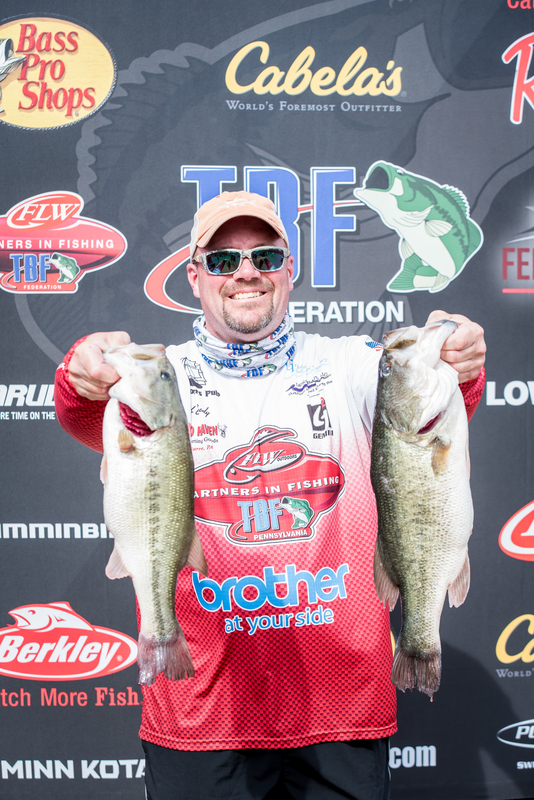 Bacon has qualified for the event twice as a co-angler but this is debut as a boater and he’s got his eyes on the FLW Tour should he solidify a win this week. 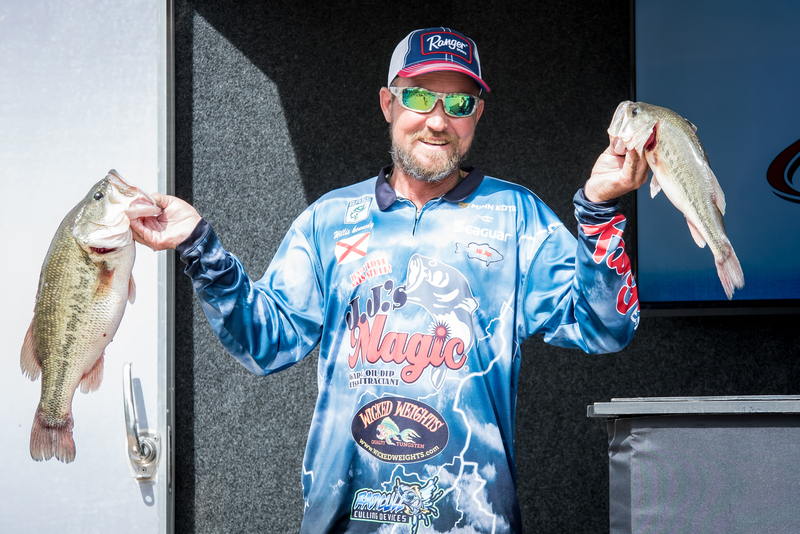 “100 percent; if I win, I’d be going to fish the tour next year,” Bacon said. Bacon has been a boater since he was 17 years old and an active member of the MASS BASS TBF. He thanked them and TBF for this experience, as well as, TBF of Board Director and former Massachusetts TBF President, Erik Kaplan and current President, Joe McKinnon. He also thanked his sponsors at Lowrance, Strike King Lures, Reynolds Boats, Triple L Insurance and Reelist. Tomorrow, Kentucky Lake will decide if his spots hold up enough to take him into the finals. Right on his lead is Bob Brody from Tunkahnnock, Penn. Brody is leading the Mid-Atlantic Division and is in second overall with a limit of bass weighing 19 pounds 8 ounces. This is Brody’s first trip to the national stage but he’s no stranger to Kentucky Lake. Brody said he’s fished the lake 10-12 times, but he claims this has been one toughest with the water levels being low this time of year, plus the amount of carp out there seemingly affecting the fish. Brody also said a special thanks to TBF and all their sponsors, the PA Bass Federation and Leggett’s Creek Bass Club. “Most of all, thank you to my family and wife for all their support,” Brody added. Leading on the co-angler side and in the Southern Division from Ala., is Willis Kennedy III with 15 pounds 8 ounces. This is Kennedy’s first year at the national contest and second year to fish with The Bass Federation. Kennedy typically fishes smaller tournaments close to home due to working on the road and having kids busy with sports. “God, family and work that all comes first,” Kennedy said. But, with the close-to-home advantage the TBF National Semi-Finals Program brings to the table he’s here today. Kennedy thanked his local sponsors, JJ’s Magic Dip and Dies, Chris Pope with Radical Culling Devices and Jim Sparone with Wicked Weights. “They have personally called me and sent me merchandise and sent me more when I run out,” Kennedy continued. The weights are tight going into tomorrow but one thing is for certain, 14 TBF Divisional Champions will be crowned. Those champions will head into the final day looking to make “Living the Dream” come true.